See that you are not saddened by the adversities of this world, for you do not know the good they bring, being ordained in the judgments of God for the everlasting joy of the elect. In days such as these, there is, along with the righteous condemnation of offenders, distrustful criticism of the Catholic Church – hesitancy even among believers to be doubtful of the innate holiness of the Church. But faithful children of the Church know with a conviction beyond questioning the certainty of God’s protection and victory over His enemies. Jesus Christ, Author of salvation and Founder of His Church, rules as a King and a Father. Far from despairing and disparaging, from wringing of hands and overwhelming dismay, the children of the Church lift up their hearts with hope in the providential goodness of such a Father! The parallel is unmistakable: Jesus betrayed by His own, then abandoned by His own. Being the good men they were, the Apostles of Christ deeply regretted their cowardice all their days – and gave their hearts all the more generously for the shame. Let us learn from the failure of the Apostles, that we may not merit the sad reproach of the Master: “Why did you doubt?” Let us rather stand fast faithfully near the Cross with Our Blessed Mother, confident in the victory that must come as the blessed fruit of much suffering, accepted lovingly, endured patiently. So we are right to grieve – and urged to prayer and sacrifice. But another spiritual solace given during these troublesome days came to us in the recent Feast of the Exaltation of the Holy Cross, September 14. This feast has a rich and truly marvelous history, which reveals the wonderful ways of God in the lives of men – their decisions, their work and their purpose in the world. Into this we will not delve much in this letter, but more into the most profound lesson of the feast. Here again we clearly see the truth of lex orandi, lex credendi, lex vivendi: As we pray, so we believe, so we live. The Feast of the Exaltation of Our Savior’s Cross, so filled with prayerful and triumphant lessons for us, gives joy, courage and instruction to the Church. The good priest who preached here at the Mass for that day, explained that it is “Go od Friday, happy” – all the lessons of redemptive sufferings, exalted. What is one of the central teachings of Our Savior, except love of the Cross – His Cross, our Cross – that is, our share in His Cross? Did He not declare to each and all of us, “Whoever will come after Me, let him deny himself, take up his cross daily, and follow Me”? (Lk. 9:23) By this we know that God sends us trials to keep us close to Him, even in lock-step! – and to unite us to Himself in everything. Christians from the beginning have lived this and were made holy by it. 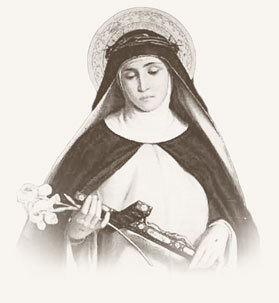 We learned from our priest that the 2nd century Church Father, Tertullian, wrote that another name for Christians was “Followers of the Cross.” St. Paul protested that he preached “Jesus Christ, and Him crucified.” And our own Holy Mother St. Teresa, understanding and praising God for the value of the endurance of crosses in life, cried out to Our Lord, “So give me Thy grace and let them come!” In light of all this “exaltation” and praise of the Cross, you will be pleased to read the following liturgical texts from this wonderful Feast of September 14th. And as you do, think especially of the above words of Jesus, our Master – His pressing invitation, admonition, instruction for life’s path and understanding it. Think of the trial that is presently upon the Church. In light of all this “exaltation” and praise of the Cross, you will be pleased to read the following liturgical texts from this wonderful Feast of September 14th. And as you do, think especially of the above words of Jesus, our Master – His pressing invitation, admonition, instruction for life’s path and understanding it. Think of the trial that is presently upon the Church. 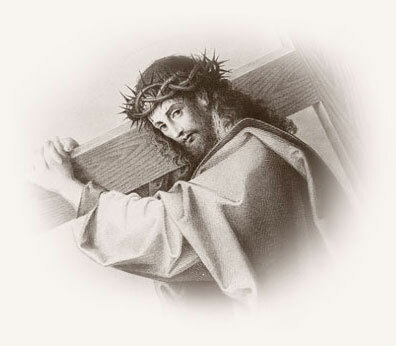 – Save us, O Christ our Savior, by the merits of the Cross! – Through the sign of the Cross, free us from our enemies, O our God! – Hail, Cross, our only hope! – V/ We adore You, O Christ, and we bless You. R/ Because by Your Cross You have redeemed the world. Yes, by His Cross – and by our share in it – He redeems the world. If we can see as a gift and blessing the providential trials He sends to us and to His Church, we will surely share in His same power and victory. In the 2nd Century, before the great battle that was to direct all of history, Christ revealed His Cross to the Emperor Constantine. It was bright as the sun shining in the sky. And the Lord spoke to him what He says to us in our own day – indeed, each and every day – “In hoc signo vinces:By this sign you shall conquer.” By the trials that I send you, you will surely be victorious over sin, over yourself, over the world, and over the evil in that world. Only trust. One of the Sisters remembers a little incident from her childhood. She was getting her hair cut, and the place for that in summertime was in the backyard. High chair set up, towel over shoulders and back up to her neck, scissors ready to chop! The dear next door neighbor lady was working in her lovely yard and looked up from her work to watch this little spectacle – clearly an unpleasant one to the tyke in the chair. She smiled and wisely called out, ” Don’t worry, it’ll be okay. You’ve got to suffer to be beautiful!” Sister has never forgotten that tiny event in her life; the wisdom of that dearly loved neighbor’s comforting words has often gone far beyond the original childish upset. 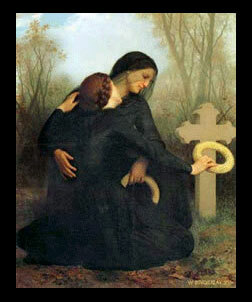 Any soul on its way through life to eternity must suffer to become the finished, beautiful beloved of God in heaven. And so with Holy Church. The holy Carmelite, Edith Stein, who took the name in religion of Sr. Teresa Benedicta a Cruce (blessed by the Cross), wrote to a friend in anguish: “It is only by feeling the weight of the Cross that one ever gains a knowledge of the Cross. Say with all your heart, “Ave, Crux, spes unica!” Hail, Cross, only hope! A ring is a sacramental? Let us remember just what a sacramental is: It is anything set apart or blessed by the church to excite good thoughts and to help devotion. It is through the prayers of the Church offered for those who make use of these sacramentals, as well as through the devotion they inspire, that they convey and obtain God’s grace and blessings. So yes, with the Church’s blessing, even a ring can be a sign that gives grace – and acts as a testimony and witness to faith. The ring, by its endless round shape, signifies permanence, commitment, eternity. So whatever design the ring bears can really send a powerful message. One of our favorites from the beginning has been the Crown of Thorns ring; but among newer designs are included the image of the Sacred Heart, Our Lady of Perpetual Help and St. Therese, the Little Flower. 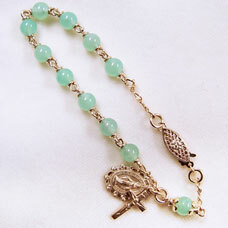 Several rings bear the Holy Name of Jesus, and another favorite of ours is the beveled Rosary Ring – beautiful! So remarkable has been the impression these rings have made, that we have recently added to our selection. The rings make a admirable gift. We think it splendid that even the Plain Band Rings we offer have served beautifully for wedding rings. 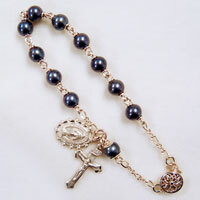 As an aside, the Rosary Bracelet works in a similar way as the religious rings – a means of grace for the wearer and for those who see the bracelet worn. 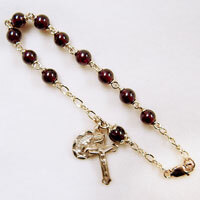 We cannot count the number of women (and men, too, who wear the cord rosary bracelet) who have told us that they wear their rosary bracelet daily, for the esteemed privilege and purpose of praying and witnessing continually. We have also expanded our selection of Rosary Bracelets, and you can now create custom bracelets choosing from a variety of our most popular semi-precious stones – garnet, amethyst, aquamarine, jade, black pearl, arizona turquoise, and more. Since above we touched on Catholic Christian history, we would like again warmly to recommend the wonderfully written history books by Diane Moczar. What an injection of courage, enthusiasm and right-thinking these books give. Written from the spiritual view, the insights are accurate and inspiring. You will learn, you will enjoy – we promise. Learn more about devotion to the Cross by understanding the Catholic prayer and custom of making the Sign of the Cross through these two books: Both with the title, The Sign of the Cross, St. Francis de Sales’ work is more specifically a devotional, prayerful guide; Msgr. Gaumé’s provides a magnificent collection of history and commentary of the Saints about this important symbol of our Christian faith. of prayer. We recommend it especially for its final pages, which include a wonderful bibliography (many books are now out of print, but some used editions still findable) and the brilliant spiritual exhortation, “A Short and Simple Way to Practice the Prayer of Faith and of the Simple Presence of God” by the great French 17th century orator, Bossuet. 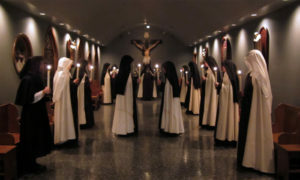 The Carmelite way of prayer and spiritual life is attractive to many, many souls. Its history and sanctity, its study and expression have proven their worth over long years now – and occupy a special place in the Catholic Church. One of its best modern teachers was Pere Marie-Eugene in his early two-volume work, I Am a Daughter of the Church and I Want to See God: A Practical Synthesis of Carmelite Spirituality. We are happy now to offer both volumes – books that explain and express clearly and simply the spirit of Carmel in its Saints – love of God, prayer, simplicity, silence, penance, solitude, self-sacrifice ..
2019 Liturgical Calendar – The ever-popular Seraphim Liturgical Calendar is now available. 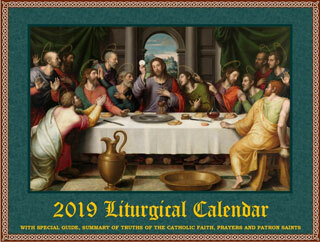 This calendar is the original liturgical calendar, published and distributed since 1981. Others may imitate, but none match the excellence of this beautiful, devotional, informative calendar – carefully crafted by devout priests who know their profession well! It is far more than just a pretty picture with the days of the month hanging on your wall, and you can learn more about it by viewing Seraphim’s promotional video. We are also taking the opportunity to re-organize some of the information on our site. It is true that we make and sell Sacramentals in order to help support our life here, but that has never been our only goal. While selling these items, we have always wanted to provide useful information: the history and meaning behind these spiritual weapons that the Church has placed in all of our hands as Catholics, so that you can use them ever more efficaciously. Much of that information is not easy to find on our current site, buried in the newsletter archive inside letters like these. Our new template will give us a format to make this information available on the product pages themselves, which we are very excited about! Technology as Apostolate! We hope to apply the new template to our site in a month or so. We will let you know when things are finished, and we hope that you will find the new site easier to use! A custom we keep in our chapel here is to place the names of deceased family members and other loved ones on our altars, and our Priests faithfully remember these souls at each Mass offered during the entire month of November. We wish to invite you to send us, before November 1st, the names of your loved ones who are deceased, and we will be happy to include these souls in this great benefit of the Holy Sacrifice of the Mass. Please click here for more details and to enroll the names of your deceased loved ones. On September 14th, that sublime Feast of the Exaltation of the Holy Cross , we renew our Holy Vows each year, according to the custom established by St. Teresa herself. With prayers for the Church and all her members during these strange and dark days, we pledged again our souls to Christ in our three vows, chastity, poverty and obedience. Our Mother Prioress urged us not to wait until some later day and better circumstances to become holy. No, not another day, but today become saints! The call to sanctity is not reserved for Religious alone, of course, so we pass on the reminder that ALL of us are called – “Be perfect,” Our Lord said, “even as your Heavenly Father is perfect.” Life is for that kind of striving – “… forgetting what is behind,” as St. Paul did, to “strain forward to what is before,… to press on towards the goal, to the prize of God’s heavenly call in Christ Jesus” (Philippians 3:13-14). The Church and the world need the leaven of Christian holiness! Well, part of that pressing forward always includes a busy life at Carmel. We dislike the much overused word, “busy,” so let’s say “well-occupied” and share with you again some of our more prominent PROJECTS! The stone patio begun in the spring turned out well, and we now have a lovely place right off the kitchen for community recreations during warm weather. We have had an exceptionally warm September with record-breaking temperatures in the 90s. What are usually crisp, nippy fall evenings this year have been almost balmy, making for a pleasant evening recreation outside. The dogs love it. The patio also eliminates muddy paws running into the house. We have undertaken other landscaping repairs – to enclosure wall, gates and hermitages. Our trees have grown so much over the years that we needed to do a good amount of trimming this past summer. The unseasonably warm weather has also extended our garden growing season. The tomatoes are ripening quite on their own this late in September – unbelievable for Colorado! This year, we branched out a little with the vegetable gardening – literally. Long pumpkin vines stretch well outside the two new patches we tilled in spring for our small crops, with 4 large pumpkins and a few small ones ripening to deeper orange every day. We’ve had several varieties of squash and tomatoes, red peppers, green beans, rhubarb, etc., along with a good herb garden, too. We had to chuckle at our pepper plants, who despite not growing over a foot tall, “gave their all,” and produced one giant red pepper apiece. Our kitchen Sister’s eyes brighten whenever we bring in an armful of harvest. Zucchini inventions have been the special scheme for the daily cooks! 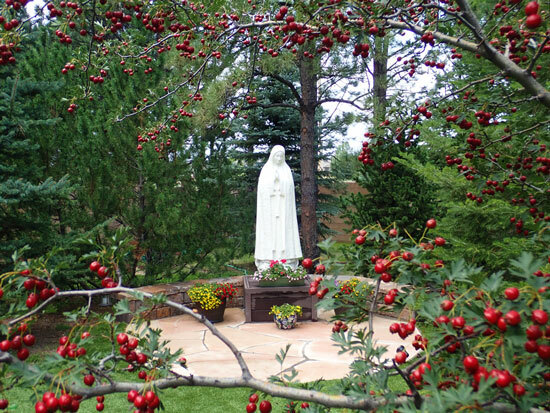 Of course, the new website is presently requiring many hours of the Sisters’ time and effort – planning, reviewing, constructing, organizing, photographing, scanning, writing – always more reviewing and scrutinizing. It reminds us sometimes of a complicated math problem, or of drawing a map as we blaze a trail through a thick forest! We do hope that God will be pleased with the results – and you, too, of course. God will surely receive the prayers of His children with compassion – and Himself inspires their prayer. May His blessings be upon us all! Copyright © 2019 Sisters of Carmel, All rights reserved.